Dentures - Mark T. Albers, D.D.S. As a general dental office, we make all types of dentures for patients who need them. 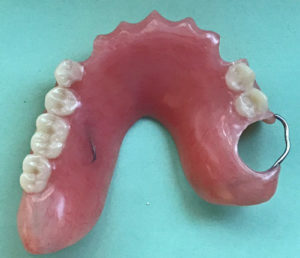 When making dentures, we focus on comfort, function, and appearance. From full to partial dentures, from cast to acrylic, we can usually provide what our patients need. Full dentures are made from acrylic and as the title implies, are used when a patient has lost all of their teeth. Sometimes this involves only the upper teeth, sometimes only the lower teeth. Usually, though, we see patients who need both upper and lower dentures. They are generally removable, but with the advent of implant dentistry, are sometimes fastened onto dental implants. Conventional dentures require multiple appointments to ensure the best comfort and function. In a typical case, a patient comes in for first impressions, from which Dr. Albers makes custom trays. At a second appointment, Dr. Albers uses the custom trays to take final, more accurate impressions. Using the second impressions, Dr. Albers makes stone casts. He then uses wax to place teeth in their proper position. A patient will come in for a trial fit. Once Dr. Albers and the patient are happy with fit, function and appearance, he sends the final try-in to a dental lab for processing, replacing the wax with acrylic. At the final appointment, Dr. Albers ensures that comfort, function, and appearance are all working to his and the patient’s satisfaction. An immediate denture is one that is placed immediately after any remaining teeth are removed. 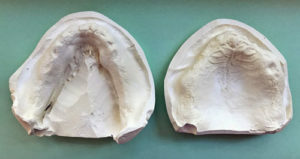 In such a case, Dr. Albers takes an impression, prepares a stone cast, and prepares a wax model with teeth placement. This is sent to a dental lab for fabrication. The lab sends the denture to the oral surgeon’s office before the patient’s appointment to remove their remaining teeth. The oral surgeon then places the denture. Dr. Albers generally sees the patient the next day to check the fit of the denture and make any needed adjustments. Because immediately dentures are placed “immediately” after teeth removal, there is no time for healing to occur or swelling to recede. Dr. Albers will sometimes reline a denture or remake them after gums are fully healed. While conventional dentures allow the best fit due to the multiple appointments to fine tune them, many patients opt for immediate dentures rather going without teeth for several months while their gums heal. Partial dentures are used when some, but not all teeth are missing. They come in two basic forms – cast partials, which incorporate metal, and partials made completely from acrylic. When we make a cast partial denture, we take an impression and send it to a lab for the metal framework to be made. Once made, Dr. Albers will try it in a patient’s mouth to confirm the fit. We then send the partial back to the lab so that acrylic and teeth can be added. Dr. Albers works with the lab to match the color of the teeth in the partial to a patient’s remaining teeth. An appointment is scheduled to deliver the partial and check the patient’s bite. 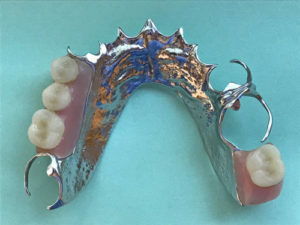 Partials made from all acrylic are bulkier and not as form fitting as a cast partial denture. As a result, they don’t always feel as comfortable. Also, food tends to get caught underneath acrylic partials more easily. For many patients, though, they make sense because they are less expensive than cast partial dentures. When working with patients, we try to find the option best suited for that patient’s needs and finances. We work with our patients on good, preventative dental care, but sometimes they lose teeth anyway. Dentures can restore function and appearance for those who have lost teeth. For more information, Mouth Healthy, a website maintained by the American Dental Association (ADA), has an article and short video discussing dentures and how to properly care for them.